First it needs to be said that I either cook a huge chicken at the beginning of the week and set chicken aside from that or we have chicken and I leave a breast to the side- I use those for the chicken on the pizza. Dissolve yeast in water. Add sugar, salt, and oil. Gradually add flour and mix. Knead until elastic (about 5 minutes). Oil bowl and top of dough. Cover and let stand in warm place for 30 minutes. Punch down. 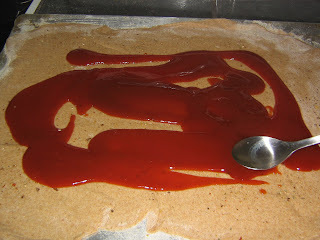 Flour and oil a large cookie sheet and roll dough out on sheet. 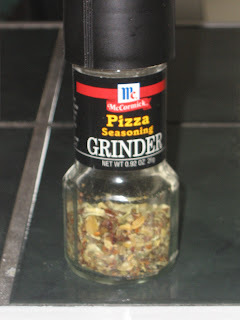 I sprinkle pizza seasoning on the BBQ sauce. 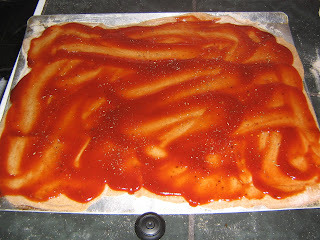 What it looks like after you sprinkle Italian seasonings and Pizza seasonings. Top with cheese. I like to experiment on what types of cheese- whatever happens to be on hand. 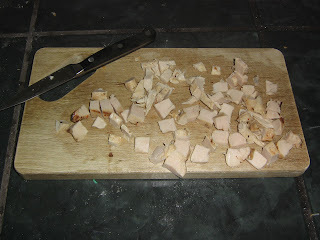 Chop chicken into small pieces and put on top of the cheese. Ta-da! This looks like a HUGE pizza and it is, but this pizza usually feeds us dinner and a couple of lunches. 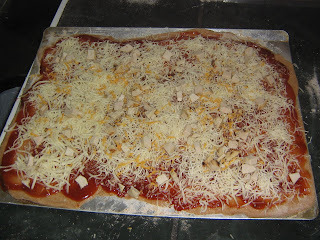 Once I get the pizza together, I cook it at 400 degrees for 10 minutes on the top rack and 10 minutes on the bottom. That's all there is to it! Totally easy and totally yummy! This simple recipe works for me! Yum. We tried BBQ chicken pizza once when there was "nothing" for dinner, and we really enjoyed it. Thanks for sharing your recipe! Yumm-O! We also have a weekly pizza night. My family is going to LOVE this one. Thanks! Try gouda and mozzerella! BBQ cx pizza is what we're having tonight! I also often add red and green onions to the bbq cx pizza I make. Delicious! This looks delicious! I'm trying it.